If you’re anything like me, decluttering occurs in fits and spurts. 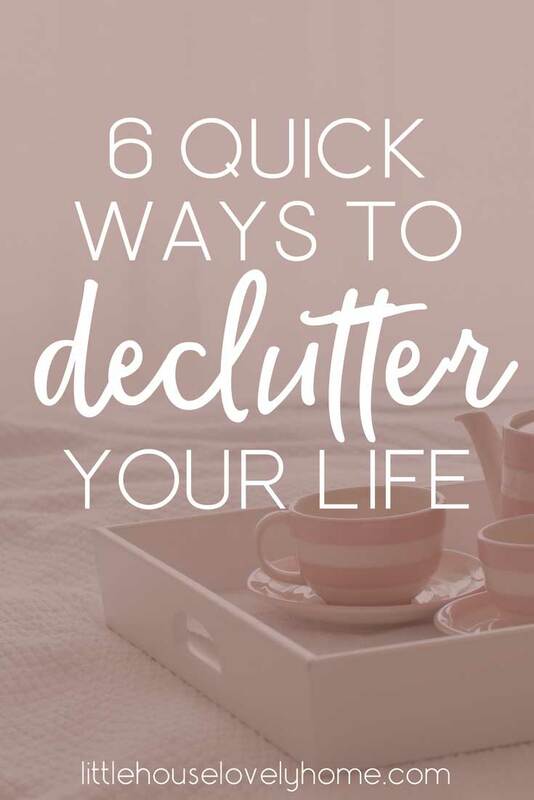 As much as I’d love to be able to declutter my entire home in one day, I simply cannot due to a lack of time and a short attention span. For those reasons, I like to work on decluttering projects as and when inspiration (and motivation) strikes. This system occurred to me after we brought our newborn son home from the hospital. I knew it’d be tough downsizing our home with a baby on the way, but the clutter just seemed more prominent when we brought home baby. And it wasn’t even baby stuff! He’s our second boy so we already had everything we needed for him. We’d just moved into our small home 1 month before he arrived, but we were adjusting well. Still, I felt completely flummoxed upon returning from the hospital. I thought we were OWNING this downsizing and decluttering thing and yet all I could see everywhere I looked was STUFF. I got a bit panicky and started a hurricane of filling the recycling bin and re-arranging. Then I got tired and the baby needed feeding so I sat down and did what I do best. I made a list. An instant declutter list of quick wins. I came up with the following 6 things that I could do to instantly feel more in control, and less cluttered. 1. Put a ‘No Junk Mail’ sign on the letterbox. Putting a ‘No Junk Mail‘ sign on my letterbox was tough for me as I love reading all the circulars that come through the letterbox. They help me plan my grocery shop and see what other bargains are out there. BUT the amount we get is overwhelming and they sit on the coffee table for days before I read them. So I’m going digital and subscribing to the email blasts of my local supermarkets instead. Another blogger I follow posted this idea. It’s simple but effective. 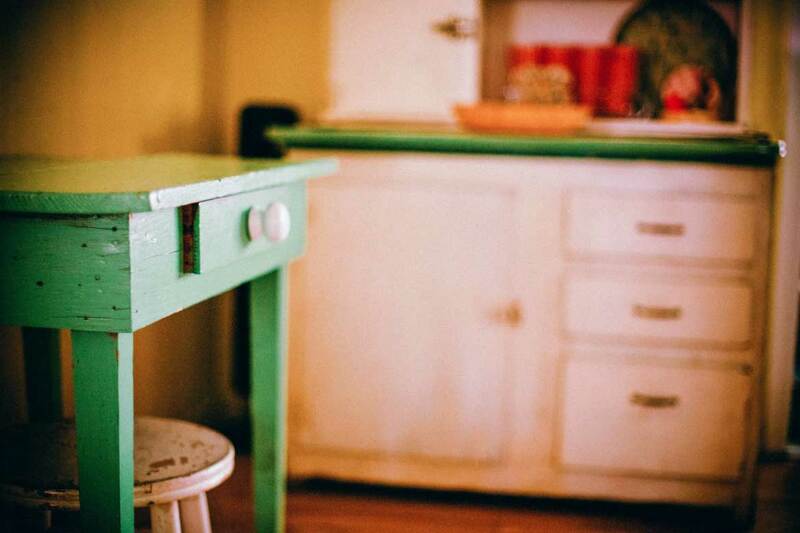 Basically, you focus on clearing one drawer at a time (I started in the kitchen). It’s just one drawer. Anyone can manage that. Or in my case, it’s been one drawer, one cupboard and a hell of a lot of boxes. I’ve been pretty ruthless with eliminating stuff, especially in my current mood. Stuff = stress right now! 3. Set a gift policy. Gosh, that sounds awfully formal. But gifts are a big source of clutter and stress. You might want to sit down and think about how you approach gift giving and receiving moving forward. When we had our second child we requested that no one buy us any baby clothes or anything we already had. 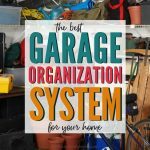 It was quite difficult to explain to the family just how drastic a downsize we have gone through – we have ⅓ less living space than our previous house and no garage so we have very little storage space. I figured that would happen – when you challenge the norm so defiantly it can be hard for others to process. Home-cooked meals to be delivered! I receive so many daily emails that I delete before even opening them. It wastes 1-2 minutes per morning so I’ve started unsubscribing. I’ve also set some email rules that forward certain messages to folders for me to view later. For example, all of the emails I receive with weekly supermarket specials go into a folder. Then when I’m planning my grocery shop I just have to go through that folder for the specials – and delete them once my list is written. You can do the same in Gmail here or Outlook/Hotmail here. My newly transformed office. Don’t look too closely – or you might see my skirting boards need a paint. 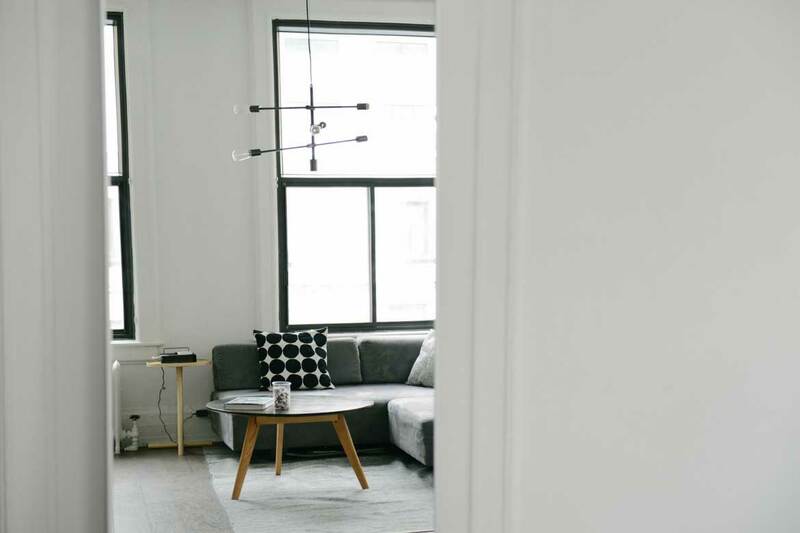 Do you have a central command centre for your home? It can be as simple as an IN tray stored somewhere out of the way. Or you can go the full monty and create a dedicated space like it did. 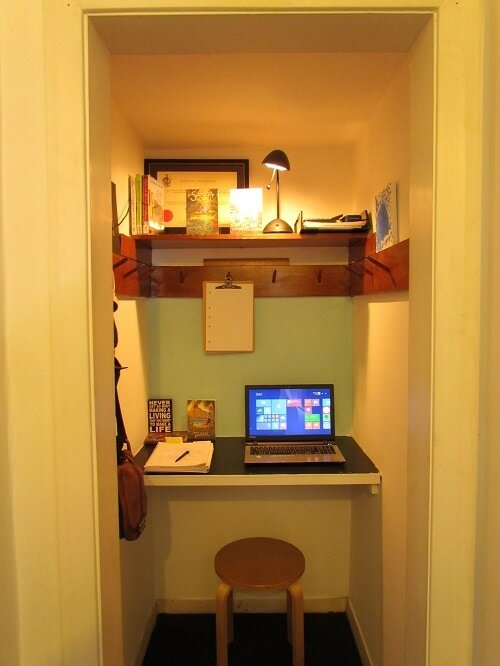 It’s called a cloffice – closet office! This was a spare (well, technically the only) large storage cupboard in our house. As we’ve managed to reduce a lot of our possessions and store the remaining stuff in the attic it was just sitting idle while I was working at the kitchen table. We really needed somewhere to store the important paperwork and for bills to hang out until they were paid (also – why can’t all bills just be email now? I hate paper). After some Pinterest inspiration, I told my husband that I wanted him to paint the cupboard. Because it was going to be my office and home command centre. He managed to source some plywood to create a desk and used the remaining paint from our house refresh to prime the walls. Then I applied a feature wall behind my desk with a free paint sample. We took the back support and armrests off my old office chair (not shown) and BOOM – Emma’s dream tiny workspace. Total cost for the cloffice = $10 for a new LED bulb. Now we can eat dinner at the table and put all letters and paperwork in one spot – an IN tray on one of my office shelves. 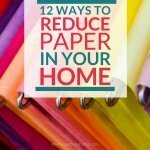 It makes a HUGE difference to have a home for all that paper that ends up all over the house. None of this work means anything if there isn’t an end result to aim for. I’m not inherently frugal or thrifty and I have too many beautiful handbags (from days gone by) to consider myself a natural minimalist. Nope, all of this is for the travel. Smaller house = less stuff = lower costs = more money for travelling. That’s the reason I’m here, doing this. Set yourself a goal to keep inspired. 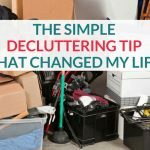 Decluttering can truly change your life, and open up new avenues. Go after them! 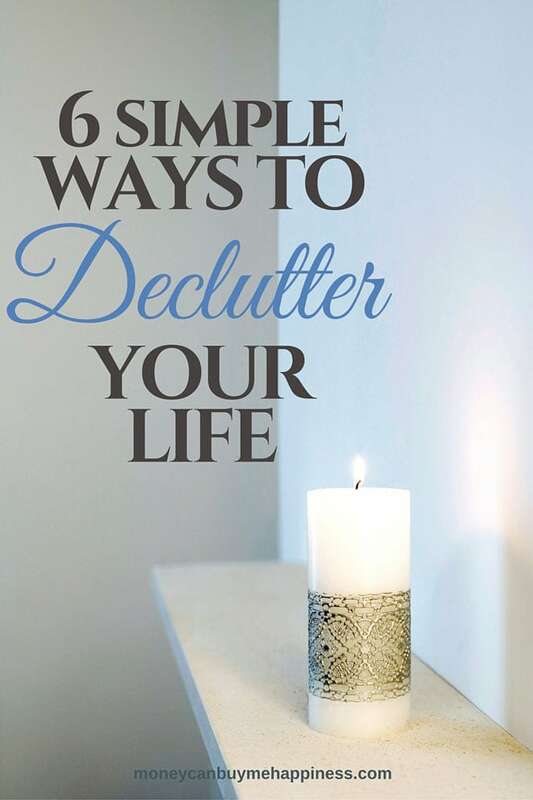 Have you tackled any decluttering projects lately?